Match is one of the world’s most famous online dating sites, and has over 20 years of experience matching singles. Eharmony is also a household name when it comes to dating online, focusing on personality testing and matchmaking. But who will come out on top when we put them head to head on the features that really matter? The sign up at Match takes under 10 minutes to complete. Once you’ve entered your basic information such as age and email address, all the sign up questions are used to help build you the perfect profile. What’s your educational background? What do you look like? What makes you tick? A well-rounded profile helps other singles know whether or not they should get in touch. We love the Match “Dealbreakers,” where you can mark certain character traits or desires as absolute negatives. This means that if you don’t want kids, or couldn’t bear a smoker—you don’t have to worry about unwanted matches in your inbox. Eharmony has an entirely different approach to online dating sites, so the sign up is nothing like that of Match. You’ll need to set aside at least an hour to complete the quiz properly, and it deserves your attention. The personality quiz is based on 29 dimensions of compatibility, and will cover how you feel about romance, relationships, work, religion, family life, friends, your job, and your emotions. 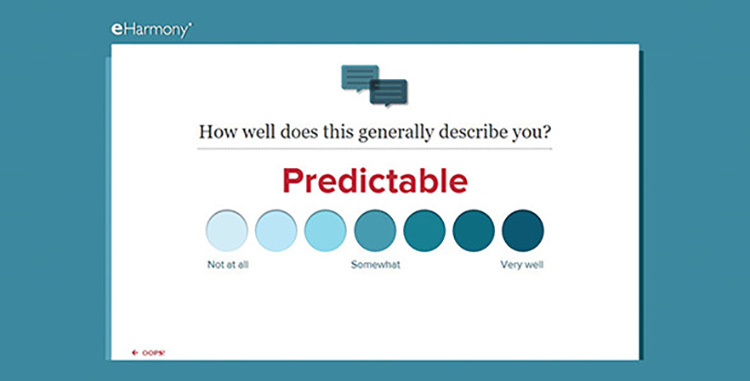 You’ll have to rate yourself on a sliding scale of dozens of personality traits and experiences, for example how caring or assertive you are, or how important faith, your family, or laughing is to you. Once the sign up quiz is finished, you will be redirected to your profile, where you can flesh out details such as interests, books, music, hobbies and of course add photos. Match offers a simple and efficient way to be browsing singles in under a quarter of an hour. Eharmony opts for time invested now, and then an easier route to true compatibility. The winner depends on what you’re in the market for. Match has a lot of easy to follow tips and tricks, from signup and profile, to communication and matching. Anytime you’re stuck, you should be able to use these guidelines to troubleshoot. There is also a very thorough FAQ section in the help center, and you can reach out for help by email and phone. Eharmony is easy to follow, but more of an investment of time and effort to use. The profile build is beautifully done, but not automatic. Your matches are sent directly to your inbox, and communication options include a guided version for those who are less confident. 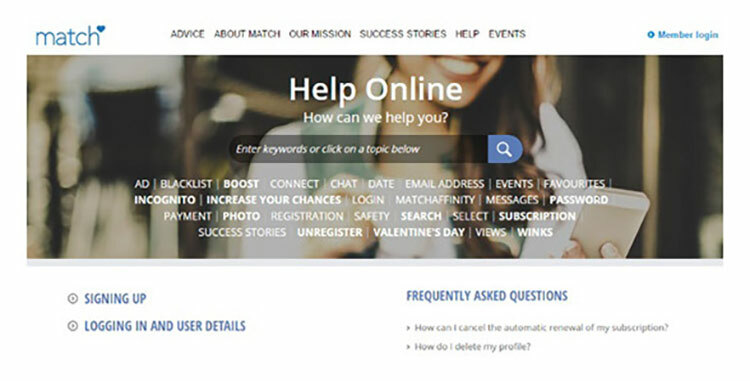 They also have both phone and email options for reaching out, but the Match help center is just that bit better—in our opinion. Both sites have brilliant support options, and step-by-step tutorials for making the most out of the site. But if you’re looking for a site for anyone less tech-savvy or who might struggle to get started, Match is the only option that checks those boxes. Eharmony is all about connecting compatible people, and you will only be able to reach out to singles who you have matched with. You can choose between open or guided communication. These options help break the ice at whatever speed is comfortable for you. You can also try SecureCall to chat on the phone without revealing your phone number. There is no live chat option or chat via webcam. Match also offers inbox chat or safe calling via MatchPhone. The chat is much more ‘real-time’ though, with options to see who is online now, and a distinct messenger option rather than just email. It’s a narrow win here for Match, because of the intuitive and simple messaging tools for instant chat. It’s not necessarily a fair comparison to put these two dating sites head to head on pricing, as they offer a vastly different dating experience. While Match is about value for money and meeting a large amount of singles, eharmony is an elite matchmaking service that focuses on finding the ones who matter. Having said that, we love the Match Guarantee, which promises you 6 months free if you aren’t happily coupled up after the first 6 months. The cheapest option at Match is $20.99 per month for 6 months, while at eharmony, 6 months is a monthly cost of $33.95, almost 50% more. 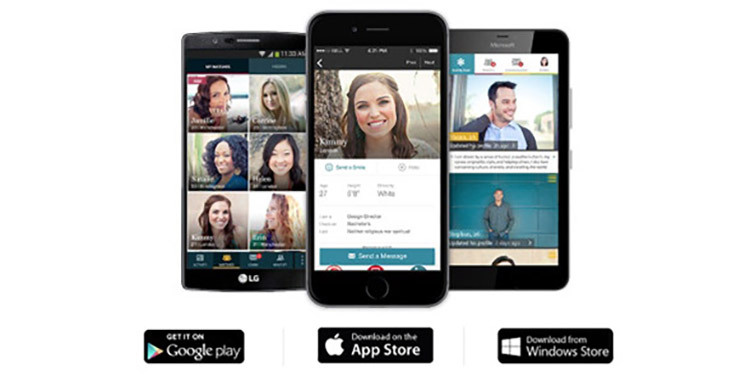 Match and eharmony both have mobile apps for all the major platforms: iOS, Android, and Windows Phone. They also both have responsive mobile sites available for anyone who is not on one of these three. Simply put, they are both excellent choices for browsing and dating on the move. 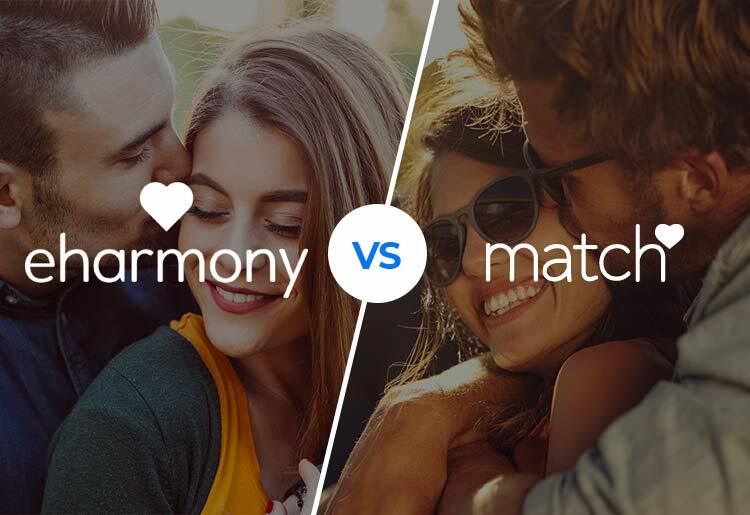 However, we did notice that the Match apps feel like a simplified version of its dating sites, while we didn’t notice any loss of features or experience using the eharmony apps. Eharmony’s mobile apps are a delight to use, simple, intuitive and with even more functionality from your pocket than on your desktop at home. Real-time notifications, instant photo uploads, and a really easy interface for users. We can’t get enough. Match would come up head and shoulders above in a search tool comparison with most dating websites under the sun. It has a powerful advanced search tool, which includes keyword search, filter search, and even reverse and mutual matches-where users can see what kind of matches they are being suggested to, and who is being shown their own profile. Specific matches each day are known as SingledOut matches, and there is even a swiping tool for singles who may have slipped through the net. In comparison to this, eharmony keeps the search options under lock and key for staff and computers only! Your personality quiz is used to suggest only the most compatible singles, and you have no way of tweaking your results. It’s certainly a hands-off approach to finding The One! There’s no doubt that eharmony has a safer feel to it than Match. The lengthy signup process puts off singles who are less serious, and all profiles and quizzes are checked before they are awarded member status on eharmony. You can also choose to use RelyID to further verify your identity, while there is no extra verification process in place on Match. Match has an option to browse incognito, but this costs extra on top of your monthly fee. Your profile can’t be safer than at eharmony, where it will only ever be seen by your matches. If you’re looking for the #1 choice for compatibility, security, and matchmaking, you should go with eharmony. But if you’re looking for ease of use, great mobile functionality, and simple signup with access to the most singles, Match. is definitely the right choice.